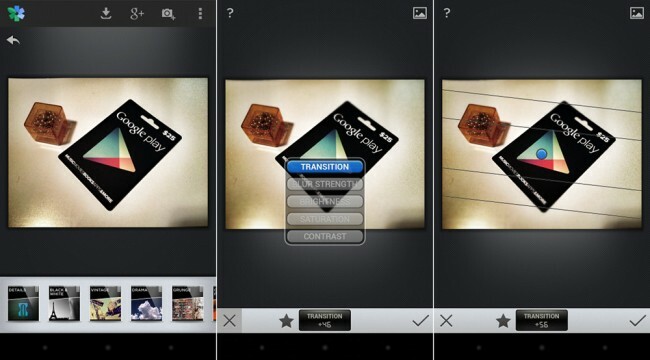 Snapseed, the award winning photo editing software that Google purchased back in September, is now available on Android. Originally an iOS exclusive, Snapseed really is one of the better photo editing apps you’ll see. Not only does it include all of the filters that users enjoy in apps like Instagram, but it also has auto correct, image tuning, selective adjusting, cropping, and more. This isn’t just another retro-filtering photo app, it’s a pretty decent photo editor that lets you fine tune any image. Once in the app, you select an image, and then scroll through the options at the bottom. This is where you’ll find your filters and other image tuning tools. To use them, once you’ve selected one, you use dragging motions from top to bottom or left to right. You can also pinch-to-zoom to expand corrected or enhanced areas. It’s a bit tricky at first, but once you play around with it, you’ll get it. It should work on both tablets and phones running Android 4.0+. It’s free on Google Play.